The Rubens House is in a search for six paintings by Michaelina Wautier. The Five Senses series dates from 1650 and consists of five signed and dated works on canvas. All that is known about them at present is a single black-and-white illustration in a 1975 auction catalogue. There has also been no trace since 1985 of the signed and dated still life Garland with Butterfly. The Rubens House is looking for these six works in the run-up to the first survey exhibition of Michaelina Wautier’s work, which is due to open at Rubens’s former Antwerp home on 1 June 2018. ‘Michaelina’ is the first survey exhibition of the Baroque artist’s work and is part of Antwerp Baroque 2018: Rubens as an inspiration. The Rubens House is looking for The Five Senses by the seventeenth-century artist Michaelina Wautier. The five individual works on canvas date from 1650 and all (or most) of them are believed to be signed and dated. They share the same dimensions (68 x 58 cm or 70 x 61 cm) and were twice auctioned as a series in Valenciennes (France) in the nineteenth century. The series belonged in 1883 to the collection of a ‘M. de Malherbe’, from which they were sold in 1898 to a certain Jean-Baptiste Foucart. A single black-and-white image of one of the paintings is the only known visual record. 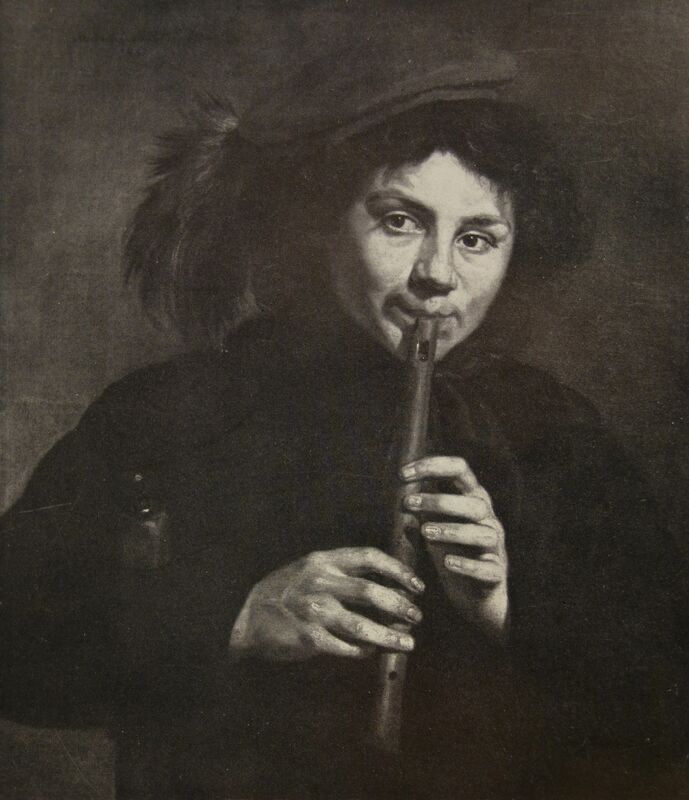 It shows a flute-player and was reproduced in a sale catalogue for the Drouot auction house in Paris dated 28 May 1975. There has been no further trace of the five works since then. According to the nineteenth-century sale catalogues, each canvas depicts one of the five senses. One painting shows a man (or youth) gazing through a pince-nez at a coin in his left hand, representing the sense of sight. A second canvas uses a flute-player wearing a red beret and sitting on a chair to depict ‘hearing’. ‘Smell’ is represented in a third canvas by a boy in a felt hat and a grey shirt, whose disgusted expression tells us that the egg he is about to top has gone bad. The sense of taste is symbolized by a young man with long red hair and a cloak eating a piece of bread. The canvas representing ‘touch’, lastly, features another youth with long black hair, who cuts his thumb while shaping a piece of wood. In addition, the Rubens House is looking for the still life Garland with Butterfly produced by Michaelina Wautier in 1652. The panel (41.1 x 57.4 cm) is the counterpart of Garland with Dragonfly, which is in a German private collection and has already been requested for the exhibition. The floral scene that is being sought is signed (‘Michaelina Woutiers fecit 1652’) and was displayed in 1960 in the exhibition Bloem en tuin in de Vlaamse Kunst (Flower and Garden in Flemish Art) at the Museum of Fine Arts in Ghent. In 1985, according to the catalogue of floral still lifes by Hairs, the painting was part of the collection of Parisian gallery owner Benito Pardo. After 1985, however, the panel disappeared from view. Garland with Butterfly and Garland with Dragonfly are the only two still lifes by Michaelina that are known of. Their importance in her oeuvre and the value of bringing the two still lifes back together therefore cannot be overstated.